It’s amazing how you can get an idea for a blog entry, thinking it’s going to be an easy one. Then you begin writing. Oh, my. This was supposed to be just a short little romantic entry about how my maternal grandparents met. As I started writing I started realizing how little information I really had on the subject. It could have been written in one line. One line does not a blog make! I suppose I could fill in the blanks with some made up fun stuff or take the time to research and read about places and things related but then I would be writing fiction. My plan is to write about some of the few things I know about my family history. And that’s not supposed to be fiction. My mother once told me that her parents met when they were both telegraphers for the railroad. That has really piqued my interest and I wanted to learn more. I had never thought of my grandmother as a working woman. I wish I still had some relatives around that could tell me the whole story. The story I have is that it all began in a little town called Kilgore in Boyd County, Kentucky. My grandmother, Julia McNeal, was born in 1879 in Kilgore, Kentucky. My grandfather, John Chase Hatcher, was born in 1874 in Louisa, Kentucky and later moved to Kilgore. Sometime in the 1890’s (ah, Victorian times), John went to work as the agent for the railroad station in Kilgore, Kentucky in his early 20’s. Coal was very big in Kentucky and it brought the rails through Eastern Kentucky to haul it across the country. He worked there as station agent and telegraph operator for about 20 years. The Kilgore railroad station was located about half way between Kilgore and Rush, Kentucky, both small towns being located in Boyd County (the next largest town would have been Ashland). I had never really thought about women of the 19th century working regular jobs outside the home. They always seemed to be portrayed as stay-at-home wives and mothers. I was surprised to learn how many young women worked as telegraph operators. Why, they even operated during the Civil War. But, why not? Women have always stepped in when the men were called to fight. The work had to continue. And I kept running across references to that age-old adage that women were cheaper to hire than men because they were only going to work a short time anyway before leaving for marriage and family. I’m surmising when I make the statement that my grandmother probably learned Morse Code and how to be a telegraph operator from her father, Andrew Creighton McNeal, since he, too, had worked as a telegraph operator. Click here for more information on Andrew Creighton McNeal. 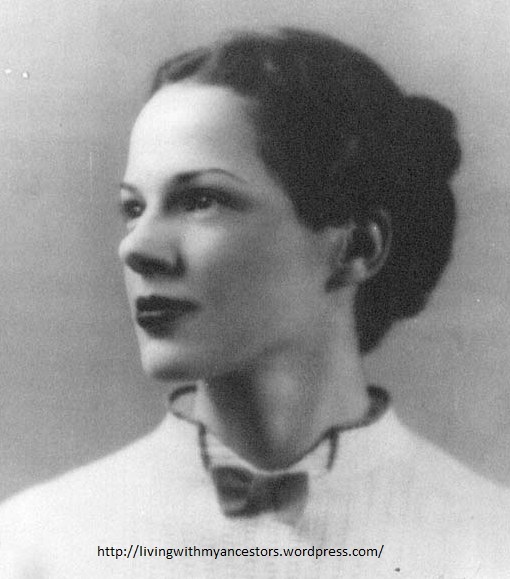 In her late teens, she went to work as a telegraph operator at the Kilgore station. I don’t know if she worked for my grandfather or with him at that time. I would hazard a guess that she worked for him as the telegraph operator while he ran the depot but, as I said, that’s a guess. But what I don’t have to guess at is that because of that telegraph, my grandparents met and fell in love. They were married in 1899 when she was 20 years old and he was 25. Of course, she added to the statistics that the young women only work a year or two before getting married! When I decided to write about my grandparents meeting, my hope was that they had actually worked as telegraph operators at different locations and that they “met” and their love blossomed over the wire. Ah, the forerunner to internet dating! I thought that sounded much more romantic! But because they both lived in Kilgore and didn’t have automobiles, I have to go with the most logical conclusion that they met while working together. This plate from Harper’s Weekly puts women at the center of telegraph operation. Men and women working as operators often “talked” during down time and romance ensued. Sort of like Internet dating for the 19th century. “The Telegraph,” Harper’s New Monthly Magazine (August 1873), 332. As a side note, I found so much information about telegraphy in the 1800’s and women’s part in it. Most people today are unfamiliar with the telegraph, not knowing how it worked or why it was so important to a country as vast as the United States. Prior to the middle of the 1800’s the fastest way to send a message or letter was by a rider on horseback (Pony Express) or by ship. Samuel F.B. Morse’s telegraph system brought an electronic highway of dots and dashes traveling along copper wires strung on poles. The telegraph was definitely the precursor to our internet of today. 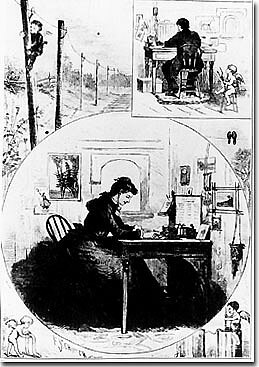 As Carolyn Marvin observed in When Old Technologies Were New, there are some surprising parallels between the experiences of nineteenth century women telegraphers and the twentieth-century story of women in the field of computer programming. Some of these similarities are technically based; the telegrapher’s work, like that of a modern computer programmer, consisted of translating English-language instructions into machine-readable codes. Morse Code is, in fact, a direct ancestor of the ASCII codes used by software programmers. The computer itself is the direct descendant of the telegraph. In a historical sense, the computer is no more than an instantaneous telegraph with a prodigious memory, and all the communications inventions in between have simply been elaborations on the telegraph’s original work. We’re together three years now. Our relationship has undergone adjustments. 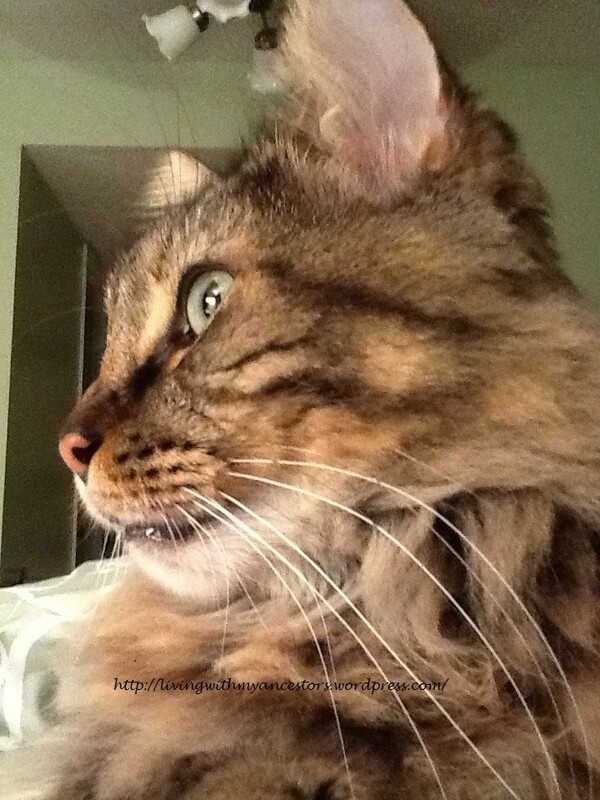 I watched him develop and mature and grow to be even more handsome and loving. I remember the first time Nicky sauntered into my life. It was early evening. He walked in slowly, tentatively. At first I didn’t think he noticed me. He is breathtaking. I keep watching him. He sneaks glances my way but never moves toward me. I watched him for a while and then I watched him wander away. I couldn’t stop thinking about him. I didn’t want to think about him. It was way too soon. George had only been gone a few months and my heart was still tender. I didn’t feel ready. I didn’t know if I could go through that again. But I wanted to see this enticing guy again. I started hanging out looking for him. Sometimes he would show up and sometimes he wouldn’t. Each time I saw him, he seemed a little friendlier. After a couple of weeks, I decided he was shy and I would have to take the initiative. I discovered that he was just as apprehensive. After three more weeks, we moved in together. I enjoy reading before going to sleep. Nicky lies down with me and cuddles while I read. That I like. But he can be pushy at the most inopportune times. He has one routine that makes me crazy but I live with it. He’s worth it. He pushes my hand. When that doesn’t work, he nuzzles my neck. He moves up to kiss my eyelids, the tip of my nose, then my cheek. He won’t take no for an answer. He is so absorbed in his own wants a drop of spittle cascades and lands on my chest. He’s oblivious and keeps rocking slow and steady. Finally, when I don’t respond, he loses patience. Smack! “Ow,” I mumble in a groggy voice. “That’s enough, stop it!” I manage to turn on my side, forcing him off me. He sits next to me with a heartrending, bewildered look of rejection. Each time it’s the same thing. He pouts, I pity. “Oh, all right, come over here,” I mutter as I reach out for him. He lies on top of me once again. This time he just purrs and catnaps like the beautiful cat he is. Back in the early 50’s my parents used to vacation annually in Florida. I was browsing through an old suitcase filled with photos. 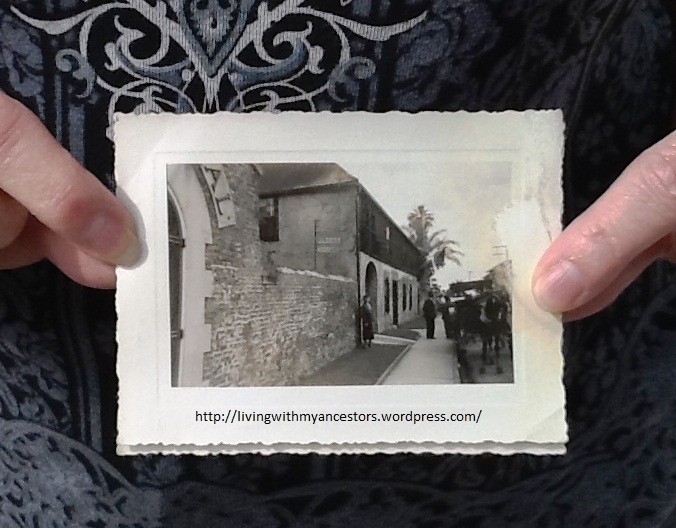 I ran across a picture taken outside St. Augustine’s oldest surviving Spanish colonial dwelling. A little history lesson. This house is one of the best-documented and most studied houses. 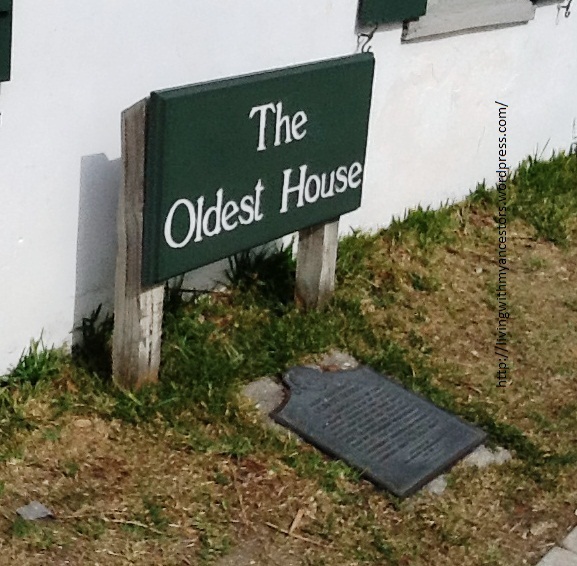 The site of the oldest house has been continuously occupied since the early 1600’s. The first house was a crude building of logs and boards. This was replaced by a building made of coquina stone, which is a native shell stone. This is found across the bay on Anastasia Island. The original walls of the ancient house now form part of today’s “Oldest House”. Gonzalez y Hernandez, an artilleryman from the fort, lived in the house. Church records show that one of his children died in the house in 1727. 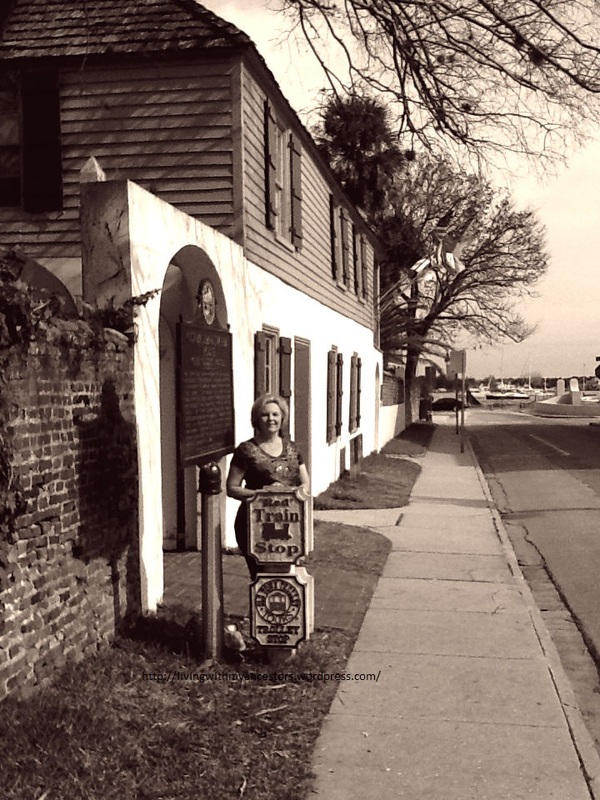 Later, when St Augustine was taken by the British, Major Peavett lived in the house until he died and then his wife (who remarried) stayed on in the house. Her second husband was a gambler and because of his debts the house had to be sold in 1790. It was bought by a Spaniard Alvarez and he and his family lived in it for almost 100 years. From 1882 the house had several owners before it was bought for the St Augustine Historical Society in 1918. Since 1893 visitors have toured the house to see evidence of the Spanish, British and American occupations of St. Augustine and to learn how the residents lived. 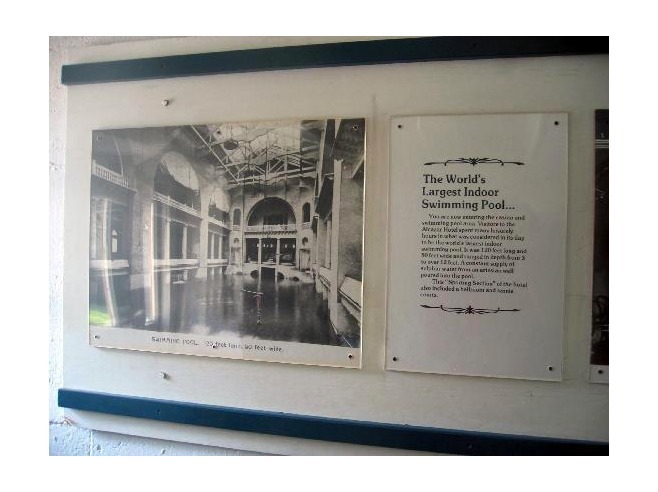 In 1970 the U.S. Department of the Interior designated the house a National Historic Landmark. St. Augustine isn’t that far from where I live. Last week, my hubby and I drove up there for an afternoon. I wish we would have had more time and money. There’s a load of fun things to do there. After all, it’s touted as the Nation’s Oldest City! There are so many quaint shops in the old downtown district. There are museums galore and tours of the old buildings and architecture. There are ghosts and gravestones. There’s the Castillo de San Marcos Fort to visit. There’s a lighthouse. Not to mention the beaches. My goodness, it’s a tourist’s mecca! It’s definitely a place I will be returning to. Now, to the point! My main purpose in driving up to St. Augustine last week was so hubby could take a picture of me standing in front of the Oldest House in the same spot as Mom. On the left is an early 1950’s photo featuring my Mom. On the right, is the picture of me standing in the same exact location where my mother stood SIXTY YEARS before! You can see the difference in the house in the photos. I couldn’t stand against the wall where she was standing because of the tourist signs they put in front. 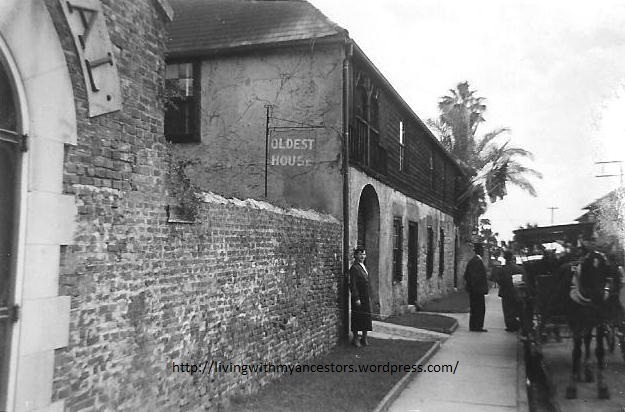 If you look closely at the house in the old photo, you can see that there was a second floor addition which extended over the arch (look at the “Oldest House” sign and you can see). The lady at the museum told me that when it was renovated in the mid-1950’s, they removed that section to put it back to the way it was in Colonial times. Apparently, at one point (she didn’t give the time period), the lady that lived there had the very first automobile in St. Augustine. They enclosed the area and the arch was the doorway to the garage. The second story was her husband’s office. Personally, I liked it better in the 1950’s photo. We finished up our excursion and had a late lunch at the Café Alcazar in the basement of the Lightner Museum. 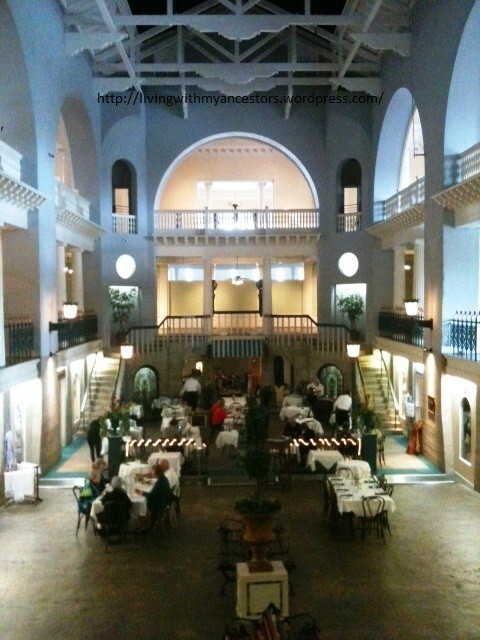 The Café used to be a huge indoor swimming pool in the basement of the old Alcazar Hotel. Click here for interesting pictures and history of the Museum. The Café’s hours are short – 11:00 am to 3:00 pm – but the service is excellent, the food is superb and the cost is very reasonable. You can see the pool in the old photo. What a time that must have been. The Café entrance we used was on the side of the Museum building and went directly into the Café. The color photo is the one I took showing the Café when we were there. There are little antique shops around the sides of the Café. It’s all very quaint. God sent a gift into my life from 1972-1974. Such a short time but I believe that there were at least three times during that two-year period that my life was protected — not to mention the gift of companionship of such a sweet animal. I was in my mid-twenties and living on my own. I decided I wanted a dog – a BIG dog! I started checking the classified ads for Bull Mastiff puppies. Well, I never got that far. I ran across an ad for Great Dane pups. Well, I thought I would just check them out. Ah, it was love at first sight. I bought my first pedigree dog. For his fine lineage, he had to have a majestic name. So I named him Caesar (I know, I know, how original). 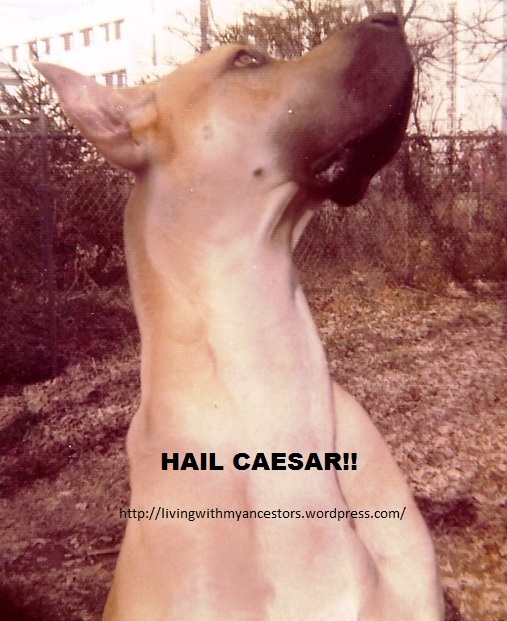 Turns out when I went to register him with the AKC, there were six other Caesars ahead of him! So he became Caesar VII. But he’ll always be number I with me!! The lady, Melinda, that I purchased him from owned the mother named Tiffany (a blue Dane). Melinda kept one of the male fawns from the litter and named him Flying Dutchman for short. I believe it was some fancy long conglomeration of names for the official record but Dutchman is what we called him. 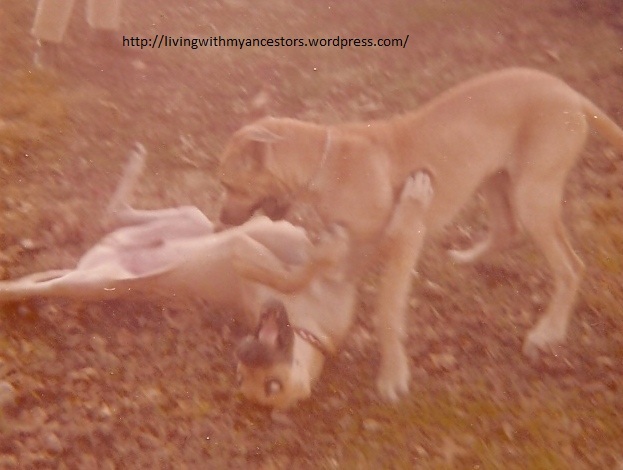 Melinda and I became friends and we would get together with the three dogs and let them romp and play. Of course, that was back in the day when there was lots of open space in Lexington. 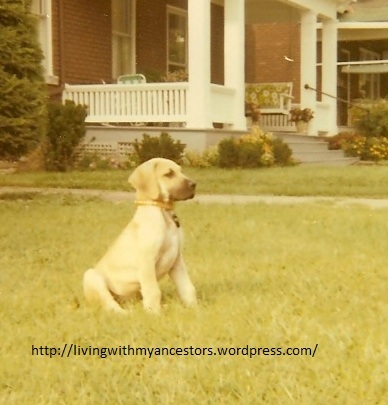 Melinda’s husband was an equine veterinarian and when they would travel, I would get to house- and dog-sit for them. Can you imagine what it’s like sharing a king-size bed with THREE GREAT DANES! And going for walks! HA! Nobody stuck around. Talk about feeling safe! At the time I owned a little 1970 Volkswagen Beetle. People would point and stare at us while driving around. It certainly wasn’t me they were pointing and staring at. Caesar wouldn’t fit in the front seat. Actually, he barely fit in the whole Beetle! He would sit in the back seat and his massive head would be in the front seat or out the window if it was open. I didn’t have a sunroof. What a sight to see! I wish I had just one picture of it. I took him through several levels of obedience training. I had to. He had to know I was in charge. When your dog weighs more than you do, you’ve got to maintain control! He was perfect. And he always obeyed. I remember when I would walk down the street with him, even though he was on a leash, people would actually stop in their tracks and cross to the other side of the street and just stand there until we were gone. He made quite an impression. I used to take him to a park outside of town that had a pond filled with ducks. He used to run along the shore chasing the ducks, never really trying to catch one. I think it was just the thrill of the hunt and watching them scatter! One day, he got a bit too close to the edge and fell in. It was at a place where the water drained and had straight concrete walls. He was struggling to get out and I could tell he was getting panicked. He wasn’t the only one. What a sight we must have been. Here I was, barely over 100 pounds struggling to pull this 150 pound dog out of the water. It’s a miracle I didn’t fall in with him. Of course, it might have been easier if I could have pushed him out rather than trying to pull him out. But I got him out and the two sopping wet companions went merrily on their way. One time when we were just “horsing” around, we were butting shoulders and playing tug with one of his toys. Yeh, a real competition! Anyway, something happened. His shoulder missed my shoulder and connected with my nose. I howled like a banshee and grabbed my nose and fell to the ground. I must admit it was quite painful. But me not being used to pain, probably overreacted somewhat. But poor Caesar. I looked up at him. He was standing over me and shaking. He knew something had happened. I suddenly felt worse for him. He was so scared because I was hurt. Poor baby. So I sucked it up and consoled him. It turned out to be a hairline fracture but I sported two black eyes for a few weeks! One example of an unusual and potentially dangerous incident was when I was sharing a house on the University of Kentucky campus with four other girls. We each had our own bedroom that locked but for the most part the house was always open to the common areas. One night, just myself and one of the other girls were at home. We had been sitting in the living room, an open common area, talking about one thing or another. Suddenly we saw the front door open and there were several guys who started to walk in the house. We didn’t recognize any of them and neither one of us had a good feeling about this. Next thing I know, Caesar is lunging at the door. What an awesome sight! That door slammed shut so fast. By the time my roommate and I got over to the door and looked out, we didn’t see anybody in either direction on the street! We talked about it afterwards and we both felt so strongly that if Caesar hadn’t been there something awful might have been about to happen. In time, we all went our separate ways. I got my own apartment. It wasn’t long after that Caesar died unexpectedly. I’ll never know the real cause of his death. In retrospect, I suspect the possibility of bloat. A horrible death and an issue not that uncommon in large breeds I learned later. 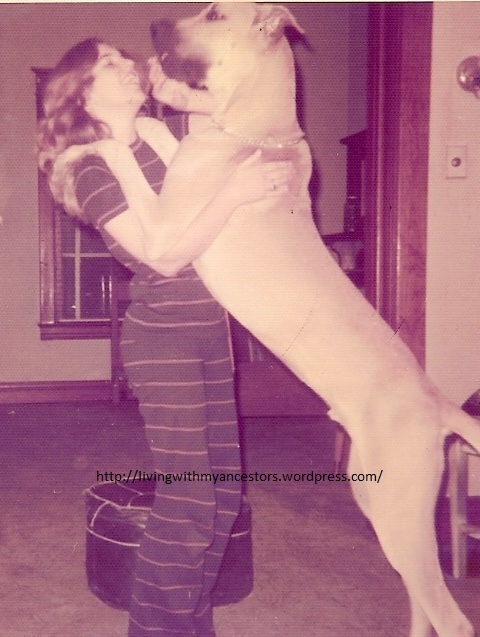 I knew so little about large dogs back then. There are so many things that could have caused it. Bloat is just my one opinion. I cried and cried. I missed him horribly. He was so very special. One night shortly after he died, I was lying in bed just about to doze off. I was thinking of him and missing him when suddenly I felt the bed bounce just like it used to when he would jump up on it. Then I felt him lay down next to my back just like he used to. I didn’t want to move. I wanted to believe he was back. Perhaps in his own way he was back. Just enough to let me know he was safe and happy. It was just a feeling that came over me but I just knew he was all right. Growing up I was never all that interested in history. In school, like almost every other student (there were exceptions, of course), history was just some ancient storytelling that had absolutely nothing to do with me or my life. Since I began chasing information on my ancestry, I have begun to develop an interest in and understanding of what those historical events meant. I have learned that my ancestors were quite a patriotic lot. I’m sure that’s a big reason why I’m so passionate about my country and the things that seem to be eating away at the very core. But I digress…. 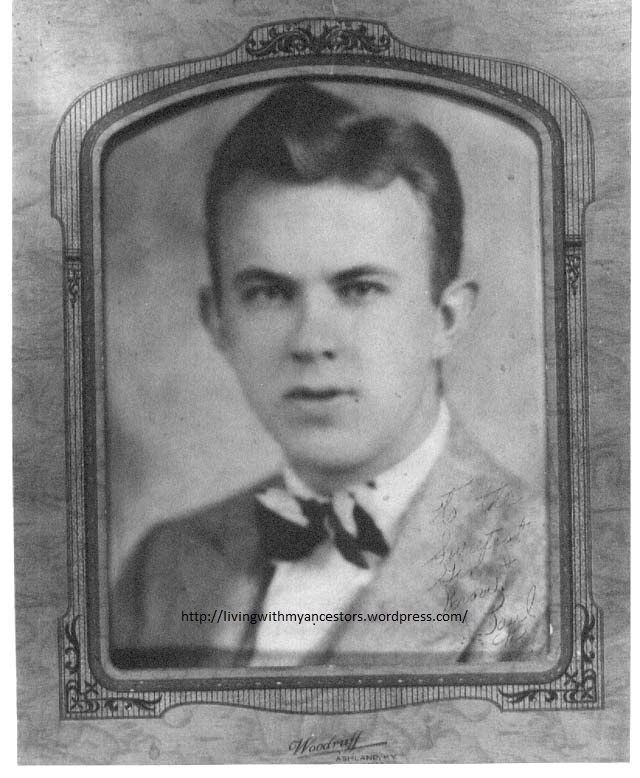 Today I write about my maternal great-grandfather, Andrew Creighton McNeal. Five feet, 8 inches tall with dark hair, blue eyes and fair complexion. Great-grandpa Creight (pronounced Crate) as he was called or also A.C., was born about 1843 in Scioto County, Ohio. He worked as a farm laborer in his teens. In February 1861, at the age of 19, he left home and enlisted with the 53rd Ohio Infantry. His military records show that he was promoted to a Corporal of Company “D”. Another report later shows him as re-enrolling as a Private after being home sick for some time. Perhaps his rank changed when he re-enlisted as a Veteran Volunteer. Later Pension reports leave his rank blank. He served a total of three years and was mustered out 11 August 1865 in Little Rock, Arkansas. I can’t begin to imagine what these soldiers suffered physically and emotionally. Almost every medical report of his recorded (and filed in the National Archives) reports suffering of diarrhea. I would imagine it would have to be from the probably tainted food and water they managed to get along their marches. 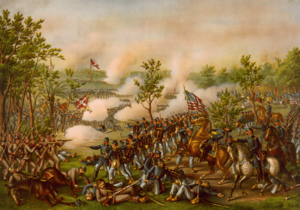 The last battle he was involved in was the Battle of Atlanta, GA from July 20 to September 2, 1864. On or about the 22nd day of July, 1864, Creight received an injury to his head under the following circumstances (as reported by various doctors): He was in the skirmish line and was behind some bridge timbers when a percussion shell struck the timbers above his head and exploded surely shocking him and causing permanent injury to his head. This causes a continual pain in the base of his brain which when aggravated by cold becomes almost unbearable and it has affected his eyes. In a letter written by A.C. McNeal in 1899 to the Commissioner of Pensions, he talks about the injuries he received during the Battle of Atlanta, together with other health issues contracted during the war. 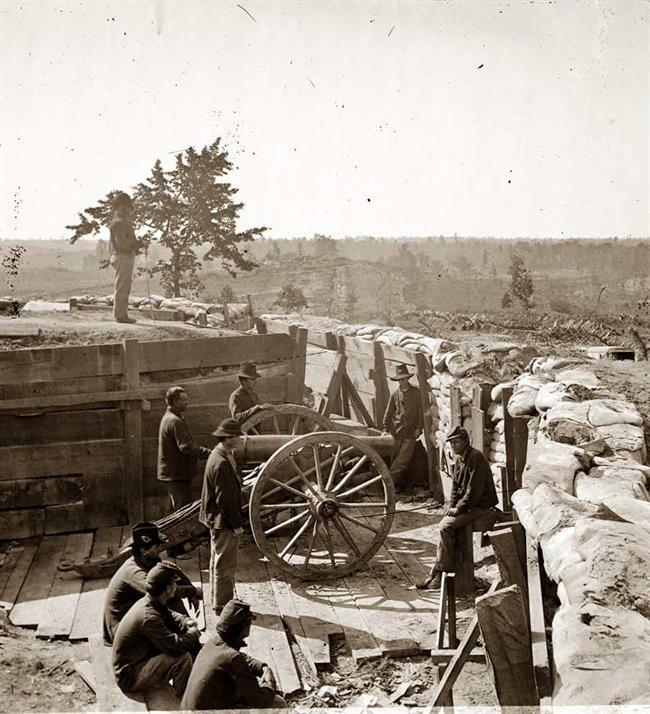 He writes: The trouble in my head originated at the battle at Atlanta, GA on the day that Genl. McPherson was killed … caused by the explosion of a shell from the enemy’s gun, in such close proximity to me that the concussion knocked me down and against a pile of RR bridge timbers and ever since there has been a noise in my head like escaping steam, and at times very painful and similar to a neuralgia. And as I grow older it seems to be getting worse and affects my hearing to a greater extent. Chronic diarrhea I contracted at Shiloh or Pittsburg Landing Tenn, but has not bothered me to any extent for a number of years. I dropped the doctors in that case and cured myself with salt, vinegar and water. Rheumatism I first felt it in my life while we layed at Little Rock Arkansas after the fall of Richmond but it was to such a slight extent that I paid but little attention to it, but it continues to hang on to my right hip and shoulder while my left leg is swollen at all times until it will measure from 1 to 1 and 1/2 inches more than the right. He continues: I am a man that can turn my hand to almost anything that I see anyone else do. Consequently, my several disabilities have not kept me from following some kind of work outside of manual labor, unless it might in a few instances that I be layed up for from one day to a week or such a matter. He returned home after the war and in 1867 he married Mary Virginia (Jennie) Hoskinson. They had three children, two boys and a girl. On the 1870 Census, Creight and Jennie were living in Greenup County, Kentucky. Creight’s occupation was listed as steam engineer, the operator of a boiler. He was in charge of the machinery at the Star Furnace in Carter County, Kentucky. In 1873, he took a job in Indiana where, for a reason I haven’t been able to determine yet, Jennie died. Creight then returned to Ironton, Ohio and in May 1875, he moved to Kilgore, Kentucky and took charge of miner’s machinery for the railroad. Sometime that year, Creight met and married Mary Columbia Woods Vaughn December 31, 1875. The ceremony was small and private being held in Creight’s home. Mary was a widow with three children. She and Creight then had two children together, Julia and Henry. Julia was my maternal grandmother. They were living in Coaltown, Kentucky during the 1880 census. He was listed as “A. C. McNeal” and as being born in Pennsylvania. He was listed again as a stationary engineer, the operator of a boiler. He was also a telegrapher (the first commercial telegraph between Washington DC. and Baltimore was installed in 1843), a steam engineer and worked at the powerhouse at the railroad in Rush, Boyd County, Kentucky. The powerhouse may have provided electrical and or steam power in support of mining activities. Creight was always reading about science and made clocks. Crate died Feb. 4, 1903 in Rush, Boyd County, Kentucky at age 61. He is buried with a military headstone in Kilgore Cemetery, Carter/Boyd County line, Kentucky. 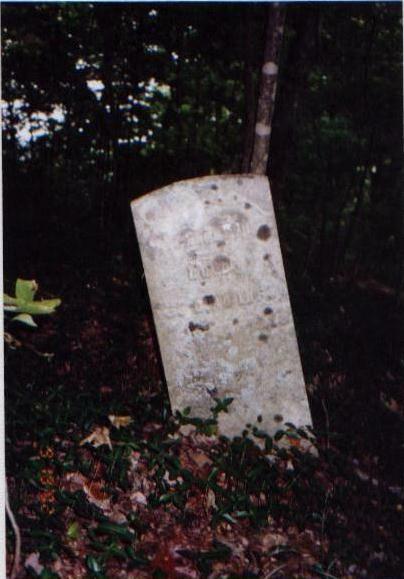 The cemetery is on the top of a hill on Route 60 near the interstate on the Boyd County, Carter County border. It basically is within the bounds of Carter County. However, this cemetery is at the turn to Rush and is located in the Rush/Kilgore area. Both of these being mining towns in their day. 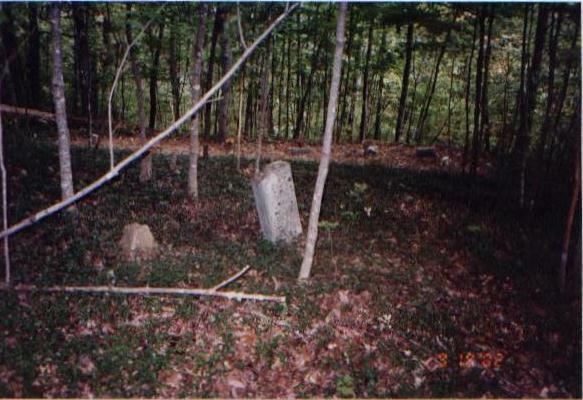 The cemetery (as of 10-12 years ago) is located in a virgin forest with periwinkles. We all do it at one time or another, sometimes alone but usually when we’re with others. Animals do it. Babies do it. Do WHAT, you say? Why, laugh, of course. Until recently I hadn’t given the act of laughter a second thought. It either happened or it didn’t. I’ve been down in the dumps lately for one reason or another. I recently received an email with a link to an article on laughter and just blindly clicked through. It turned out to be a documentary video by filmmaker Albert Nerenberg about Laughology. About WHAT? Laughology? I had never heard of it either. Neuroscientists, psychologists, medical doctors, and just people in general have taken an interest in laughter, including laughter as medicine. There are even Laughter Yoga groups. I Googled laughter yoga and over 2,000,000 links appeared. It seems it’s a form of Yoga employing self-triggered laughter. There’s even a Laughter Yoga group close to me. I bet there’s one close to you. It’s international! And why not? Laughter is a universal language. Where does laughter come from, how does it originate? Is it from the heart or the head? I could write a book. Oh, wait, the experts have already done that! So, I’ll just blog a little on the subject. Babies begin to laugh by about the age of 2-3 months. They’re not taught. I mean, really, have you ever seen anyone stand over their infant and say, now, here’s how you laugh. Follow my instructions. Do as I do. I didn’t think so. In fact, studies have been done that show that blind babies, deaf babies, and babies who are both deaf and blind, laugh on their own at about the same time as babies without these impediments. Watch little children. They seem to laugh at almost anything and everything. I once read that children laugh on average about 400 times a day. By the time we’re adults, we’re lucky if we’re laughing 4 times a week. The timing of this couldn’t have been better for me. As studies have shown, and through my own personal experience, people are stressed to the extreme. Stress kills laughter. If you’re stressed, can you deny the truth of that statement? And, if you’re not stressed, please write and let me know how you’ve managed to be the only one avoiding it. How long has it been since you actually and honestly laughed out loud. Oh, sure, we occasionally laugh with our friends or over a funny movie scene. But I mean when was the last time you experienced an honest-to-goodness roll-on-the-floor belly laugh with tears running down your face. Can you even remember? Do you really care if it’s not dignified? Should one care? Stress destroys laughter and promotes heart disease. Now, that’s not anything to laugh about. Dr. Madan Kataria, known as the Laugh Doctor, said “When you laugh, you change, and when you change, the whole world changes”. It’s true there are times when we must be serious. But being too serious is actually a kind of disorder. Just look around you. People walking around with their cell phones plastered to their ears or texting like mad. No breaks from the stress of the job or life’s responsibilities. We’re wired 24/7. Just listening to the media reports can set your teeth on edge. It’s just not healthy. I’m no medical expert but I know when something is not good for me. And I know when something is good for me. And laughter is definitely a good thing. I watched and was laughing along with him so hard I had tears. It was wonderful! If you were able to sit through that and not laugh out loud, then I suggest you seek help! 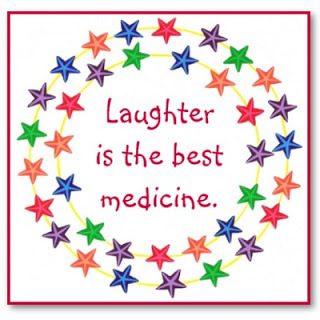 There is so much more that can be said about laughter. I am amazed at how much interesting material there is not to mention personal opinion and experience. This probably won’t be the last post I have on this subject! Laughter is — or should be — a major part of our lives. Make it so. My mother. . .I asked her once how she and Dad met. She told me he picked her up one day in front of the drugstore. She then laughed coyly and I was never able to figure out if she was serious. I found it kind of hard to believe since she was always so prim and proper about things. It makes me laugh because knowing my Dad, it was probably true! That scoundrel! I suppose it is true what they say — opposites attract. Oh, the stories Dad used to tell. He told how some of his best buddies were officers with the Ashland Police Department. I’m sure that was probably a good thing for him. You just never know when you might need someone in authority! Just kidding (I think). I do imagine he was pretty rowdy in his youth. I had that impression not from things he would say but more from the things he didn’t or wouldn’t say. He grew up under entirely different circumstances than Mother. She came from a large well-to-do family and he came up from the streets. His mother died when he was 2 and he was cared for by relatives. I could never really get him to talk much about his family life so I have just tried to fill in the blanks. He grew into a very kind-hearted, honest and generous person so that’s all that matters to me. Mother and her twin sister became engaged about the same time. Dad had to deal with quite the meddling future in-laws. Mom and Pop put their collective feet down and ordered both girls to immediately break off their respective engagements. My aunt, bless her heart, did as she was told. The family talk was that she was so broken-hearted she never fell in love again. She never married. My Mother on the other hand, defied her parents and eloped. Dad told a story of their wedding night. Well, part of it anyway. When they returned to town, he somehow learned that some of his cop buddies had found out about his marriage. Their plan was to “arrest” him and make him spend his wedding night in jail. Somewhere along the way, he deposited Mom in a safe place and shortly thereafter a high-speed chase ensued for miles. His cop buddies were chasing him along those little Appalachian curvy, hilly roads determined to “arrest” him. He “let” them catch up to him at the hotel where he worked. He convinced his buddies that he would go along peacefully if they would have some celebratory drinks with him. He got them drunk, he got away, and Mom and Dad finally had their honeymoon! But the drama didn’t end there. My grandparents (I’d say more my grandfather) were so against the marriage that they forced Mother to file for a divorce. Before the hearing, Dad and Mother were not allowed to see or speak to one another. But Dad was not done yet. It had taken him seven years to convince her to marry him (I think he had a lot of competition!) and he wasn’t just going to go away. He also had friends at the courthouse. Remember this was not a large town. He convinced (or maybe bribed?) someone to get him and Mom alone in a room for just 10 minutes. Well, when the Clerk called their names to appear, they were long gone. My grandparents gave up and never tried to interfere again. My parents were together for 52 years until Dad passed away. I’m so glad it worked out for them. Especially since I wouldn’t be here otherwise. And I’ve got to be me –who else would I be?